I thought of making the second half of the title ‘and apostolic succession’, but the concept of apostolic succession is not under consideration in what follows, but the textual representation thereof in manuscripts. This is the book of the generations of Adam. In the day that God created man, in the likeness of God made he him; 2 Male and female created he them; and blessed them, and called their name Adam, in the day when they were created. 3 And Adam lived an hundred and thirty years, and begat a son in his own likeness, and after his image; and called his name Seth: 4 And the days of Adam after he had begotten Seth were eight hundred years: and he begat sons and daughters: 5 And all the days that Adam lived were nine hundred and thirty years: and he died. 6 And Seth lived an hundred and five years, and begat Enos: 7 And Seth lived after he begat Enos eight hundred and seven years, and begat sons and daughters: 8 And all the days of Seth were nine hundred and twelve years: and he died. In what we might call a ‘New Testament’ context, or ‘apostolic’ context (that is, Early Christian), the genealogies of Matthew and Luke serve to tie the narrative of Jesus of Nazareth into the salvation narrative of the Old Testament, seeing Jesus as the Messiah and the culmination of Hebrew salvation history. When a person who knows the stories of the Hebrew Bible reads Matthew’s genealogy, the stories come to mind — Abraham and the promised son, Isaac. Jacob and Laban, then his sons ‘Judas and his brethren’, including the tale of Thamar. We meet Booz (Boaz in most contemporary versions) and Ruth, Jesse and David, then David and Solomon, with a reference to Bathsheba. The genealogy leads the people of Judah through the exile. It is a reminder of the salvation history of the people of Israel from Abraham to Jesus, Son of Mary. Jesus is the Christos, the Messiah, the Anointed One. He came to save the people of Judaea/Israel — this mission is even embedded in his name Je-sus, ‘YHWH saves’. For the Christian mind, this is the function of Jesus’ genealogies. History for us today is thought of as an attempt at dispassionate reading of the past, an attempt to assess with as little bias as possible the sources of the events and currents and ideas of the world as it has gone before us, and then to make that world accessible to today’s world. History for most of history has been an exercise in a variety of other purposes, classified by the ancients (e.g. Quintilian) as an art alongside rhetoric, rather than a(n attempted) scientific discipline. For Late Antique and Carolingian Christians, history was even a theological discipline, in one way or another. Those like St Augustine of Hippo in City of God who had more nuance in their thought were careful to argue that ‘bad things happen to bad people’ makes no sense of history, and is even contrary to the Bible: ‘he maketh his sun to rise on the evil and on the good, and sendeth rain on the just and on the unjust.’ (Mt 5:45 KJV) People like Hydatius, on the other, were pretty sure the horrors through which they lived were evidence that the end was nigh, and the Anglo-Saxon Chronicle cites the Norman Conquest of 1066 as God sending the French as a punishment for the sins of the English. Nonetheless, there are other ways that subtler Late Antique and Early Mediaeval thinkers saw history theologically, and if we are to understand these canon law manuscripts and those periods of history, we must understand how they read and understood the past and what their best representatives believed, not simply lowest-common-denominator Late Antique and Carolingian thought. Simply put, history is a grand drama, and its climax was in the incarnation of God the Word as Jesus of Nazareth, fully God and fully (hu)man. Everything BC marches up to that point, to the fullness of time, the kairos; everything AD flows from it. Everything BC is the praeparatio evangelica (to borrow the title of a book by Eusebius of Caesarea, fourth-century Christian historian), the preparation for the Gospel — this includes the Jewish nation, the Greek philosophers, the Roman Empire, the pax Augusta. The Hebrew Bible’s geneaologies fit perfectly well within this Late Antique and Early Mediaeval praeparatio evangelica. The history of the Church, flowing from Pentecost to the day of the writers, is the continuation of the drama that had climaxed at Golgotha and the empty tomb. The pope catalogue, I believe, takes the place of the genealogy in history as interpreted in the New Covenant of Christianity. In the world of ancient Israel, the Covenant was forged in blood — the bloodline of Abraham, Isaac, and Jacob, whose descendants worshipped YHWH at Tabernacle and Temple. Kinship is important, and YHWH made his ways known to people within the kin-group of the nation of Israel. Christianity forged a New Covenant in the blood of Jesus of Nazareth (cf. Mt. 26:28), sacrificed on a Cross outside the walls of Jerusalem. It was participation in this blood that made a third race, as second-century Christians were already viewing themselves — not Jews, not Greeks/Romans/barbarians (that is, Gentiles), but something new in the world. This was a spiritual kin-group of brothers and sisters who were members of a royal priesthood with God as their Father. As Jesus had said, God could make sons of Abraham out of the stones if he desired (Mt. 3:9). There is no place for physical, biological lineage in this new nation of the New Covenant and the new promise, forged in the drama of God’s incarnation as the Nazarene. The new lineage of the new family of God is spiritual. The churches of Late Antiquity and the Early Middle Ages saw themselves as the visible representation of this great spiritual family of God. The heads of their households in the cities were bishops, and they acknowledged each other as legitimate in an international network of communities of the faithful. Bishops routinely address each other, ‘Most esteemed brother.’ They referred to presbyters, deacons, and the laity as ‘sons’, and were often referred to as ‘Father’ (pater or papa). This included a recognition of the historic, major apostolic centres of Christianity — Antioch, Alexandria, Rome, with Jerusalem added at Nicaea in 325. These apostolic centres served as organisational structures for discipline and unity; their bishops, eventually called ‘Patriarchs’, were meant to look out for and after their own regional familial communities. In the West, Rome is held with greatest esteem, even if there were disagreements about how Roman auctoritas might play out in real life (see various fifth-century letters between Leo the Great and bishops of the Province of Viennensis). Because the compilers of these canon law collections saw themselves and their local bishops as part of the ongoing promise of God to the human race, as part of the inheritance of the covenant forged in Jesus the Christ’s blood and recapitulated each Sunday in the Eucharist/Mass, a catalogue of popes was not merely a handy list of who’s who. A catalogue of popes was a visible representation of the cosmic history of the church from Christ’s apostles to the compiler of the canon law book, from Peter to Linus to Clitus to Clement, on to Damasus, Siricius, Anastasius I, Innocent I, Zosimus, through Leo I, Hilarus, Simplicius and then Gregory I and so forth. These men and their letters, their sermons, their tractates, their liturgies, the stories of the lives, were a living bond between the Christian in, say, Gaul and the Apostles in Jerusalem, Antioch, and Rome centuries before. The Christian Church for the compilers of canon law books was not merely an institution with regulations as visible in the books. It was a living community of brothers and sisters in the faith, with a spiritual lineage stretching back to the salvation of the world in Jesus Christ. A catalogue of popes is a visual representation of this apostolic bond, and a genealogy of Jesus Christ is a similar visual representation of the covenant between YHWH and his people for the 2000 years from Abraham to Jesus, born of Mary in Bethlehem of Judaea. A pope catalogue, then, is a spiritual genealogy of the theological history of the world. This entry was posted in Ancient World, Books, Christianity, Classics, History, Mediaeval, Patristics and tagged canon law, catalogues of popes, collectio corbeiensis, collectio teatina, history and memory in the carolingian world, manuscripts, old testament genealogies, paris lat 12097, rosamond mckitterick, vat reg lat 1997 on July 5, 2016 by MJH. So today I finished off one round of work on a manuscript that lives in Cologne at the Erzbischöfliche Diözesan- und Dombibliothek; its shelfmark is 212. The collection of documents in this manuscript is called — originally — Collectio Coloniensis. In my notes, I just call it K. I’ll refer to the manuscript as Cologne 212 from hereon in. 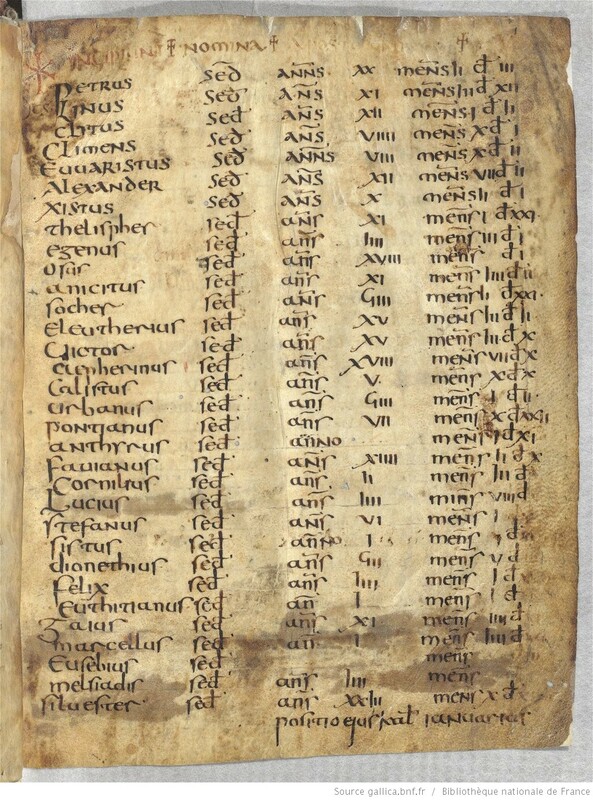 Cologne 212 is a manuscript from the turn of the seventh century (so, c. 600) written in a single column in a half-uncial hand. Rather than describe what a half uncial is, I refer the reader to the image on the left. It is also written in scripta continua — continuous writing. No breaks between words. This can be annoying. In fact, if you take your eyes off this massive block of text too long, it becomes very difficult to find your place again. Cologne 212 is a very exciting manuscript for my research because — regardless of how early the collections that dwell within them were compiled — most of the manuscripts I work with are Carolingian or later — so, eighth- or ninth-century books; like the manuscript I talked about most recently. Cologne 212, then, is potentially very significant. It was written during the papacy of Gregory the Great (590-604) and shows us at an undeniably precise moment what knowledge of Canon Law was like in Gaul (‘France’ as you call it today) as well as the state of the texts (how good/bad they are). Because most of our collections, even when dated early, exist in later manuscripts, manuscripts like Cologne 212 shold pique the interest of every canon law scholar. Just to give you an idea, one canonical collection (collection of material pertinent to canon law) that is related to the collection in Cologne 212 is called Frisingensis Prima. Scholars date the collection to about a century before Coloniensis. Its manuscript (Cologne, Clm 6243) is from the late 700s. One of our other earliest collections is called the Collectio Quesnelliana; Quesnelliana is dated to sometime around 495, maybe a bit after. It is transmitted in seven manuscripts, of the eighth, ninth, and twelfth centuries. 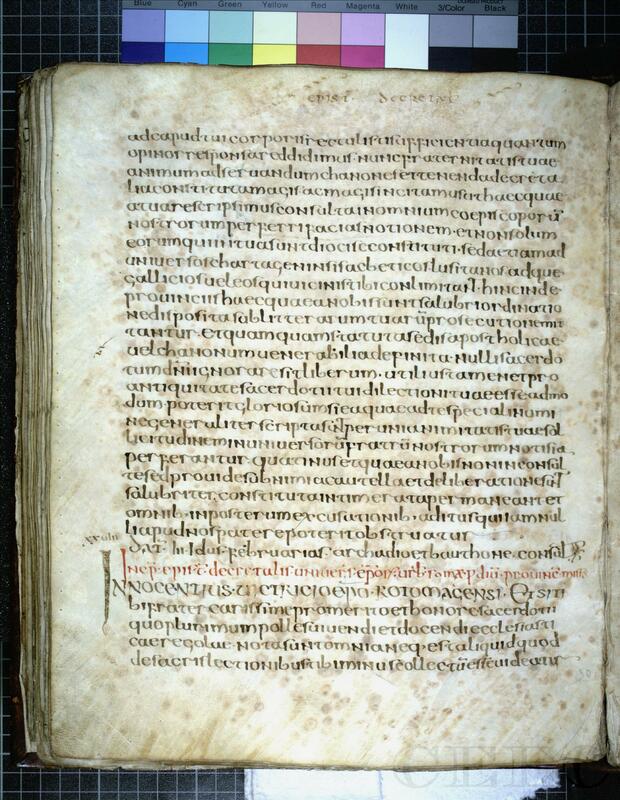 The earliest securely dated Quesnelliana manuscripts are from c. 780. Another canonical collection that many scholars (but not Rosamond McKitterick!) date early — 500-525 — is the Vaticana; two of its manuscripts are eighth-century, and the third is ninth-. Another early sixth-century collection is Sanblasiana — its earliest manuscript is eighth-century. The very famous Dionysiana, in its form with papal letters from c. 525, exists in nothing earlier than the ninth century. I could go on. Cologne 212, then, is special. It is an early canonical collection that is contemporary with its manuscript. Only a few early collections exist in manuscripts so close to them in time. Out of the canonical collections I surveyed in my Ph.D., only three, in fact. The other two are: the sixth-century Corbeiensis in a sixth-century manuscript (Paris, lat. 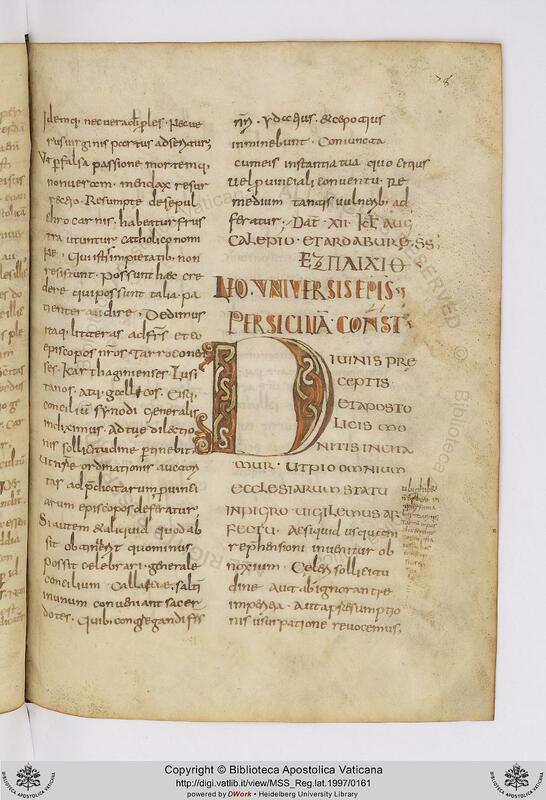 12097); seventh-century Albigensis in a seventh-century manuscript (Toulouse 364 + Paris, lat. 8901). Cologne 212 is not only close in time to its gathering — its gathering is close in time to the composition of its texts. Amongst its varied contents, it contains canons from the Second Council of Vaison in 529, the Fifth Council of Orléans in 549, and a letter from Pope John II to Caesarius of Arles from 534. Several other sets of documents from sixth-century councils and Caesarius are contained herein — mere decades after their composition. The texts I’m looking at — letters from Popes Siricius (384-399), Innocent I (401-417), Zosimus (417-418), Celestine I (422-432), and Leo I (440-461) — are on the whole less than two centuries out from their original composition. Not bad, all things considered. So, what did I find in Cologne 212? Well, yesterday and today I was looking at the group of papal letters associated with all of the above popes except Leo. It comes in this manuscript with the heading, ‘INCP CAN URBICANI.’ As a result, the selection of letters immediately following (not including Siricius, but anyway…) goes by the name ‘Canones Urbicani’ in the scholarly literature. These letters, whether in this particular order or not, come up in a number of different manuscripts, and the textual criticism of them is my current project. 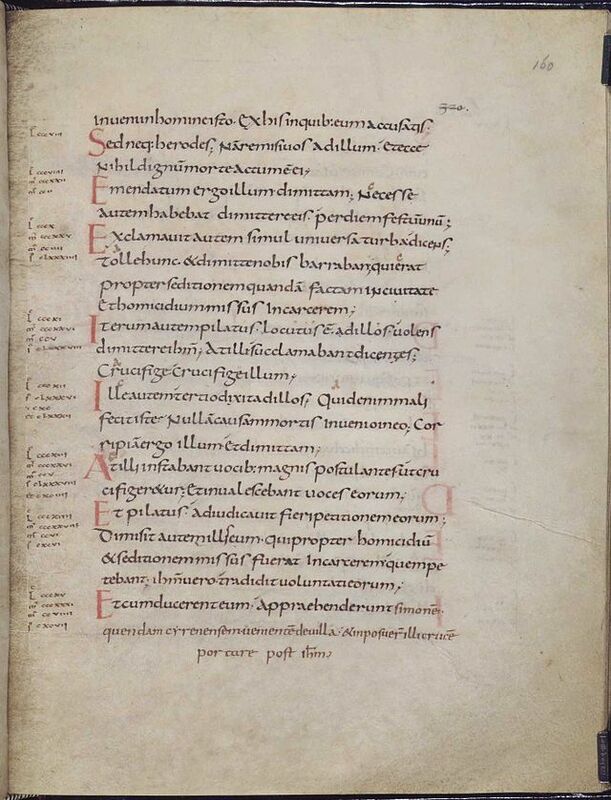 My initial response to the text of these letters as I went through Cologne 212 was that they share a lot of variants with W and Te (as I term Collectio Weingartensis, in this manuscript in Stuttgart, and Collectio Teatina in Vat. Reg. lat. 1997). I am still trying to sort out W in my mind, but I do know, having studied Vat. Reg. lat. 1997 a lot, Te is definitively Italian and shares a lot of readings with a lot of other Italian canonical collections. So Gaul and Italy are not so far apart — yet. I still have a lot of other manuscripts to look at, some of them from Gaul. Unfortunately, Cologne 212 is not a perfect manuscript. 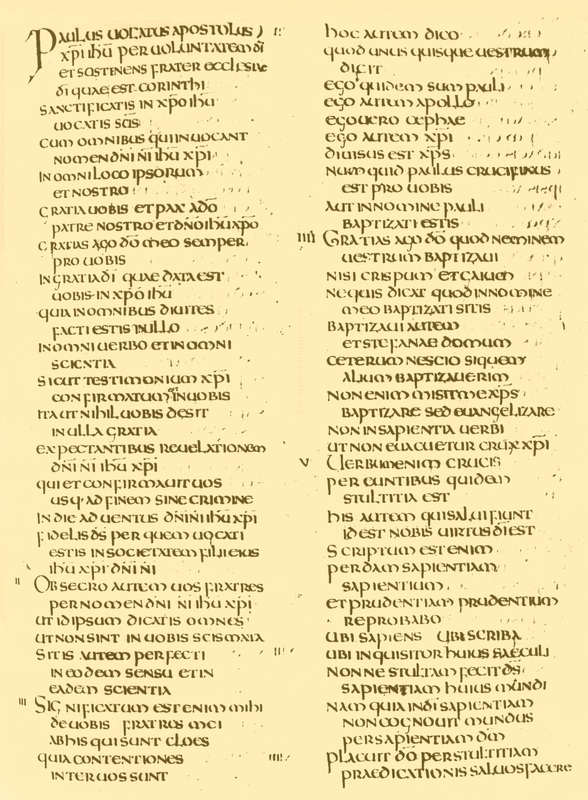 As you can see on this page, the letter of Celestine I to the Bishops of Apulia and Calabria runs into the text of his letter to the Bishops of Viennensis and Narbonensis — the former letter ends at ‘blanditus inludat’ in the second-last line. But instead of giving the date and then a new heading, the text runs into chapter IV (as divided in the Ballerini edition from 1757 now in Patrologia Latina 56) of the latter letter, ‘ordinatus uero quosdam’. This, as it turns out, is common for the rest of this group of letters. A few more chapters fall out of this letter, and then again in the letter of Pope Siricius of Himerius of Tarragona. So, as far as those missing chapters are concerned, ‘low quality’. Presumably it was copied from a damaged exemplar. But I also found something I’m still thinking about. Since these temporal phrases don’t turn up in the other manuscripts I’ve looked at for this letter — Dionysiana, Dionysio-Hadriana, Weingartensis, Teatina — the temptation is to reject them, especially Dionysiana and Teatina are definitely old and definitiely Italian — even if their manuscripts are newer. Another reason to reject them is that they are the sort of thing I expect to be added to canon law manuscripts. These manuscripts were written as sources for canon law, I believe. Therefore, it is not unreasonable that someone would slip in information that makes them more practical. These are standard canonical time periods and ages. If Siricius didn’t actually write them, a scribe could imagine that he had. Indeed, a scribe could have written them as interlinear notes that were later incorporated. That’s how these things work. You have to read between the lines. Just in case someone else was. This entry was posted in Ancient World, Christianity, History, Mediaeval, Patristics, Writing and tagged ballerini, canon law, canonical collections, celestine i, collectio coloniensis, cologne, himerius of tarragona, manuscripts, pope siricius, rosamond mckitterick on February 11, 2016 by MJH. Page of text (folio 160v) from a Carolingian Gospel Book (British Library, MS Add. 11848), written in Carolingian minuscule. From Wikiwand. As I say, the manuscript under discussion is a canon law manuscript. Its contents list the Concordia Canonum of a fellow named Cresconius, the Collectio Dionysio-Hadriana, and then a bunch of other material we call the Collectio Dionysiana adaucta, closing with some selections of St Augustine about the Trinity (I didn’t take time to determine which selections). Cresconius’ Concordia is a rearrangement of the Collectio Dionysiana by theme, rather than chronology. So passages from church councils and papal letters are taken from the their original context in the Dionysiana and given together by topic. It was made to be a handbook for bishops who try cases. A fragment of Cresconius’ introduction is. But of what follows, all we find is a list of the tituli (chapter headings). This moves straight into a catalogue of popes that ends with Nicholas I (858-67). Catalogues of popes are one of the ways we can date either a manuscript or the collection of documents it contains. In this case, it has generally been assumed that Vallicelliana A.5 is from the papacy of Hadrian II (867-72). Mordek, in Biblioteca Capitularium (1995), simply states that the manuscript is from the mid-ninth century. 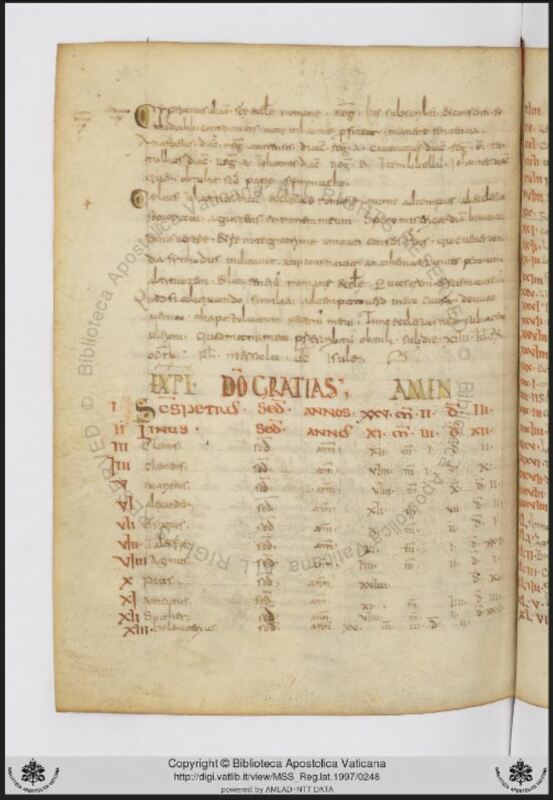 However, it was clear to me when viewing this manuscript that the words for Pope Nicholas were written by one hand and the numbers by another. Unlike the earlier popes. I suggest, therefore, that the manuscript was penned during the pontificate of Nicholas I, and that the dates for his papacy were filled in by a second hand during the pontificate of Hadrian II — or later. After this catalogue of popes comes the preface of Dionysius Exiguus to his canonical collection, then a list of all of his tituli, then the text of the augmented version of Dionysius’ collection called the Collectio Dionysio-Hadriana (so called because Hadrian I sent a copy to Charlemagne whence all others come). After the Dionysio-Hadriana comes the Dionysiana adaucta. Pretty straightforward. These are the things in the manuscript. There are various ways ms A.5 can tell its story. One is simply by telling the story of the Dionysio-Hadriana adaucta — a story wherein the government and regulation of the church is taken care of by church councils and popes. And what makes that story especially interesting is that papal letters pertinent to canon law (decretals) become much thicker on the ground in this collection at the same time that local councils thin out. The only fifth-century local council that I recall seeing in this collection is the anti-Pelagian Council of Carthage of 418, presided over by Bp Aurelius of Carthage (but ratified by Pope Innocent I!). Whereas the fourth century was dominated by local and ecumenical councils, the fifth is dominated by popes and ecumenical council. A second way (and then I’m done!) this manuscript can tell us its story is paratextual elements. Paratextual elements are, things beside the text — the layout of the page, the size of writing, the choice of bookhand, the behaviour of a scribal corrector, the decoration, the order of contents, etc. The most interesting paratext in this manuscript runs folios 33v-35v — that is, two spreads of open pages and the back of one (manuscript pages are numbered only once for front and back, then recto and verso). Here we meet what has been seen as one of the defining moments of Church history since the later fourth century, and especially since the Council of Ephesus (431). Late Antique Latin Texts’, Greek, Roman, and Byzantine Studies 51 (2011) 461–482). Most medieval books display what McKitterick calls a ‘hierarchy of scripts’ (‘Script and book production’, in Carolingian Culture: Emulation and Innovation, 222) — but especially the Carolingians. Here we see the hierarchy: uncial – capitalis – minuscule. The prestige of this Creed, then, goes a long, long way back. And it was clearly seen as the most important thing in manuscript A.5 by whoever put it together, giving the Creed the royal treatment (literally, if you think about it). This love of Nicaea, with its anti-Arian anathemas (these are included in the version in this ms!!) and all, helps explain why A.5 ends with the teaching of Augustine on the Trinity. Augustine was/is the most pre-eminent of the Latin Church Fathers, and Carolingian Christianity embraced the Church Fathers as an integral part of its own heritage. Who better than Augustine, then? And so the manuscript concludes. Thus I conclude: This manuscript tells a story. The story is that of the rise of the papacy and the church councils. The story of church order from the (apocryphal) Canones Apostolorum (‘Canons of the Apostles’) to the reforming work of Pope Zacharias in the 700s. The person who created it believed strongly in the Trinity, so the climax of the story is the Council of Nicaea and its Creed. The last word is given by Augustine — about the Trinity. Every manuscript is unique. Every manuscript tells a story. We just need to learn how to read those stories. *But not Christadelphians, Oneness Pentecostals, Hillsong (I think? ), Mormons, Jehovah’s Witnesses, Unitarians of any sort, and undoubtedly other groups. This entry was posted in Books, Christianity, History, Mediaeval, Patristics and tagged apostolic canons, biblioteca vallicelliana, canon law, capitalis, caroline minuscule, carolingian canon law, cresconius, manuscripts, rosamond mckitterick, uncial on January 15, 2016 by MJH.